I do love a doll but Troll dolls are something else ! I remember having a gonk as we called them with wild hair and ugly cute face from the 70s but never really knew the history. I have been collecting the later ones made by Russ berrie love them from the 90s renovating them. So here’s the story. A Troll Doll (Danish: Gjøltrold) is a type of plastic Doll with furry up-combed hair depicting a troll, also known as a Dam doll after their creator danish woodcutter Thomas Dam The toys are also known as good luck trolls, or alternatively gonk trolls in the United Kingdom. Thomas Dam (May 15, 1915 – November 12, 1989) was a Danish woodworker and fisherman associated with Gjol in Denmark Dam designed and invented the original Troll Doll also known as the “Good Luck Troll”. He created the toy during a period of financial distress, They say he made the doll for his Daughter as a gift and carved it from wood. Soon, the family had started up a new business and Dam earned enough to buy himself a small factory where the dolls were produced in plastic. Dam created many different trolls as well as plastic baby dolls. Dam formed “Dam Things” to market the dolls. 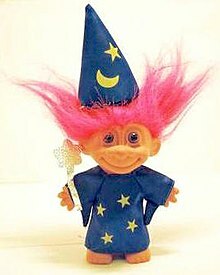 Dam trolls are now considered collectors’ items. Even the Victoria & Albert Museum have one in their collection. Some of the dam trolls are still found today and sell for lots of money to collectors. The clothes made of felt and disintegrated over the years so some have no clothes. I would have loved one of the larger troll dolls but came in many sizes. I have fell in love with the soft bodied Russ berrie troll dolls made in the 90s before the dam company took back the rights, Not a lot of info about these but I only know quite a few companys did their own version of the troll. these trolls are varied girls boys all in outfits with bright coloured hair 12” high also made the all plastic ones. Love the story give me a great idea for pictures of trolls in the forest thats if I can find them? do you remember trolls old school memories Big ones, Little Ones, Lucky ones,magic ones, Amazing.